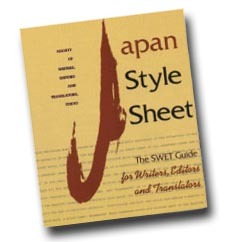 Whether it’s a book title in a bibliography, a few lines of poetry, or a snippet of dialogue, romanization of Japanese in English text is a skill every wordsmith associated with Japan mobilizes now and then, and though it may seem easy, there are many intricacies the committed editor will want to polish. Close encounters with romanization do present various dilemmas. Are we breaking words apart correctly? When are those bits independent words and when not? When do we use hyphens/apostrophes and when not? When is an open space better than a hyphen? The LC rules, which are also used in Canada and perhaps to some extent in the U.K., have been in existence in their current form since the 1980s (and seem to go back to guidelines drawn up in 1959). They are continually updated for grammatical logic, readability, and consistency based on recommendations from the Council on East Asian Libraries (CEAL)’s Committee on Technical Processing. These rules are widely followed by editors of scholarly and commercial books about Japan.